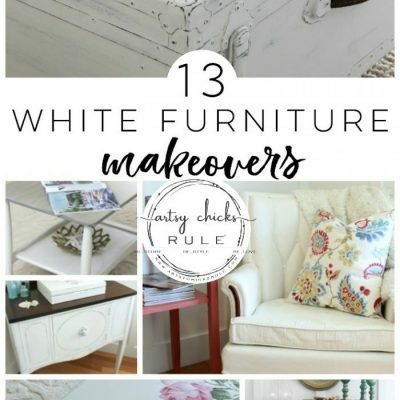 Time to get back to furniture makeovers! One of my very favorite things. I haven’t painted too much lately and am so looking forward to getting back to it! I haven’t been out looking for any new pieces in months! So today I’m sharing this makeover I did last year. 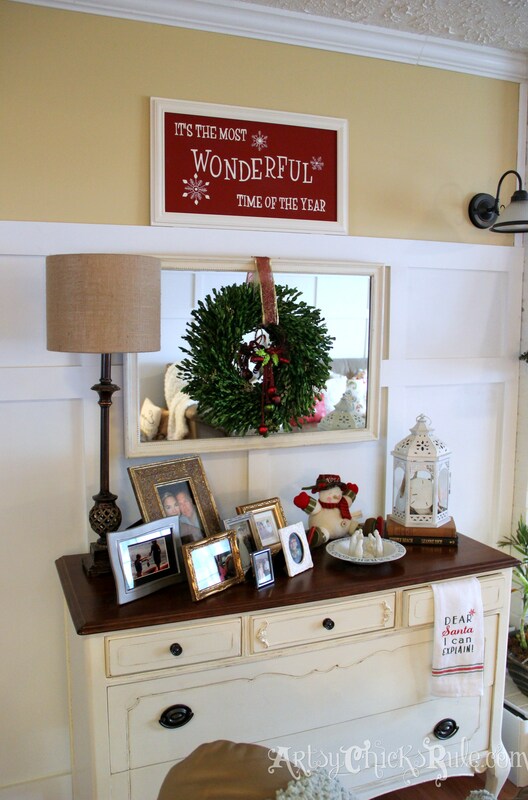 It’s an old antique dresser/mirror that was featured in my Holiday Home Tour, Part 1. It’s a favorite of mine. I purchased it about 10 years ago from a flea market/antique dealer. This is the mirror. I don’t have a picture of the dresser “before”. 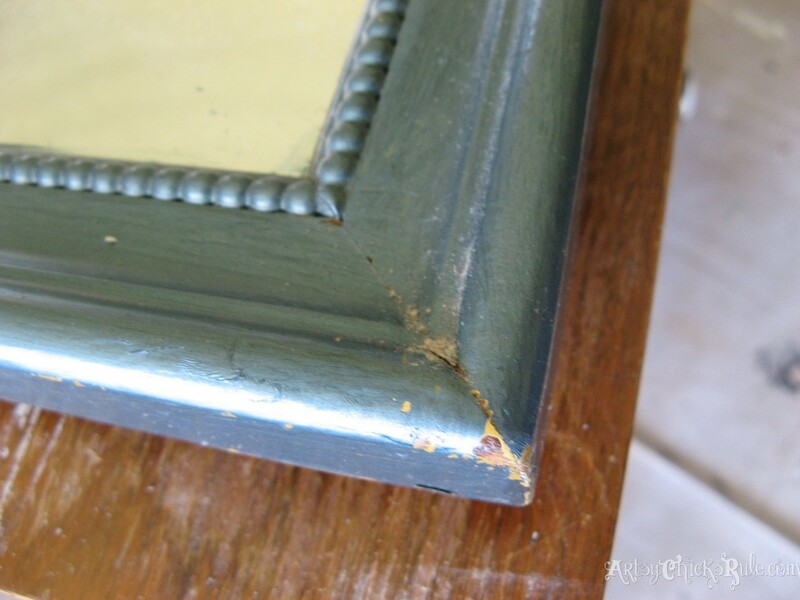 The only reason I have the mirror “before” is because it sat untouched until just recently when I decided to paint and use it. 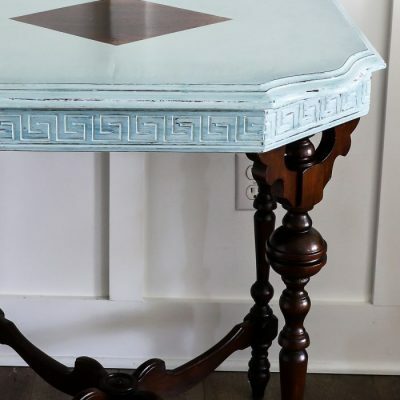 So when I bought it, I just painted right over top of that blue paint with an off white latex paint and then added a glaze over that. It was not a really great transformation, in my opinion. Blah. And so came the idea recently to strip it. Ha, didn’t know what I was in for with this particular piece. It had 4 coats of paint to remove. The one I applied, the blue one and 2 different yellow shades. 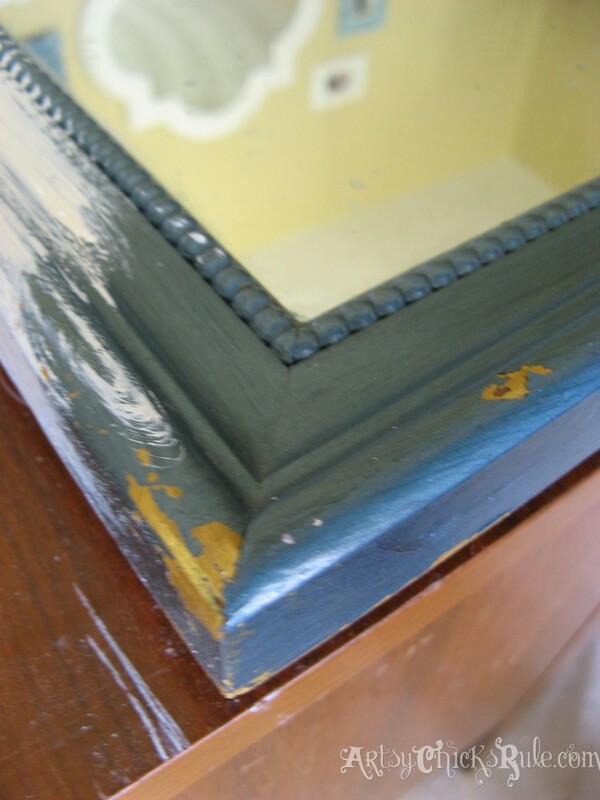 I did lightly sand where the paint was chipping/rough…then painted with Chalk Paint. I used Citristrip to remove the paint. But there it is in the background, behind the chairs….all stripped. It was a nightmare to get completely off. Not fun. AT all. (ha, just noticed hubby in the yard with the shop vac, cute ;) ) It’s hanging out on the porch because it had been such an ordeal to strip…I just HAD to take a break from it for a bit. 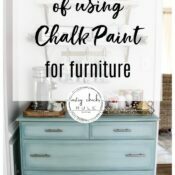 I, for the most part, do not buy furniture any more that is painted. UNLESS the paint is in good condition and I can paint right over top of it. Stripping paint is not fun and some paints can contain lead. I like fun (and my health) so I skip that if I can! The base was solid and in good shape but I ended up having to peel away the veneer from the drawer fronts. It did not survive all that paint removal process. 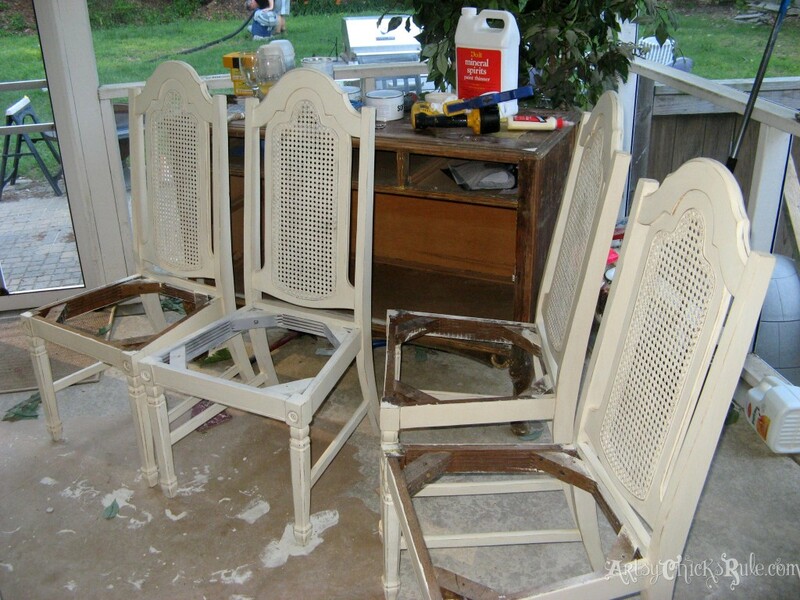 ….I primed the entire thing well with the sprayer and then brought it in to hand paint the rest. The top was so gorgeous under all of that paint that I re-stained and poly’d it. ~I applied Minwax Pre-Stain Wood Conditioner first. ~Then used Minwax stain in English Chestnut. ~Followed by Minwax Polyurethane in a Satin finish. I had to repair one of the “teeth” at the bottom of the trim…..I hadn’t when I first purchased it. 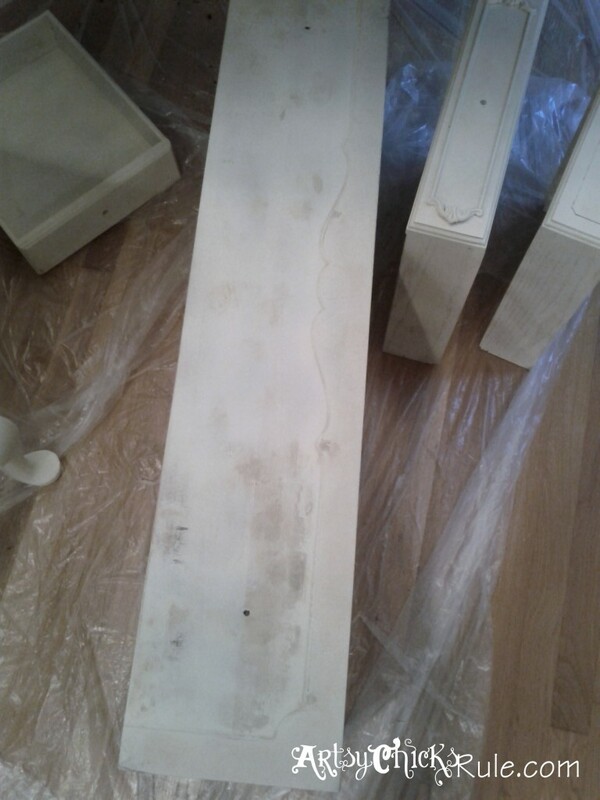 I used wood putty and just shaped it like the rest….then carved a line down the middle to create the space. 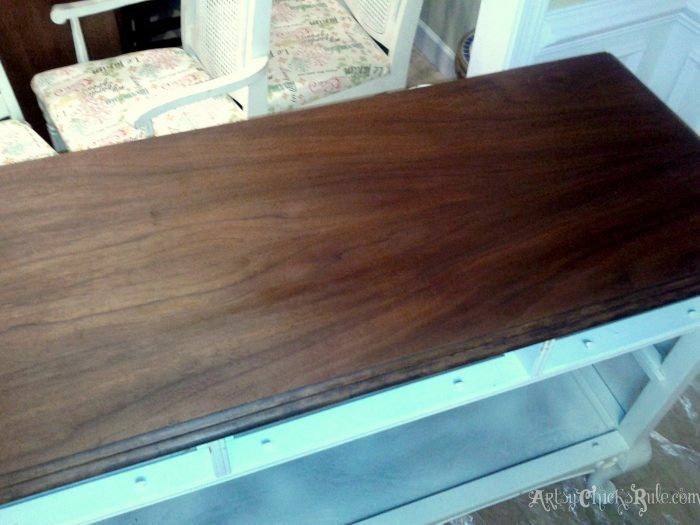 That finished top just makes me sighhhh….isn’t the wood so beautiful? When the drawers were stripped you could see the round impressions of the old pulls. I wanted to get it as close to “original” as I could. These were shiny yellow brass…until I sprayed them with Oil Rubbed Bronze spray paint, by the way. Then added a touch of gold to the edges to “antique” them up a bit. The bronze ones I found online were super expensive…these weren’t! But I turned them bronze anyway. I used to have it in the Dining Room as the “liquor” cabinet. I have since found and painted something else for this spot. This one fits the space much better. I finally painted that mirror to match (I used Old White Chalk Paint for that….latex on the dresser) and hung it over top of the dresser. It’s a (VERY) heavy old mirror. I now store our DVD’s, movies, workout videos,etc, in the drawers. The top 3 drawers have misc controllers etc. Great storage! 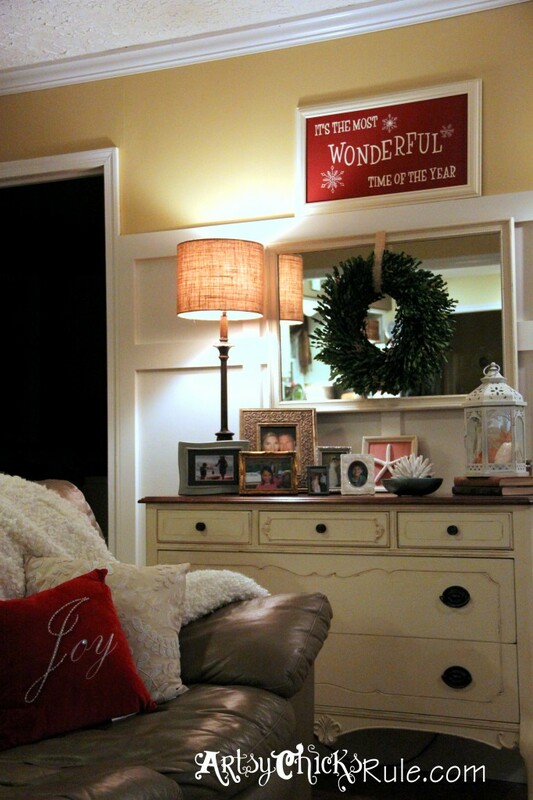 And I just love it in the Family Room….perfect spot for it with the mirror over top. Finally in it’s rightful place. 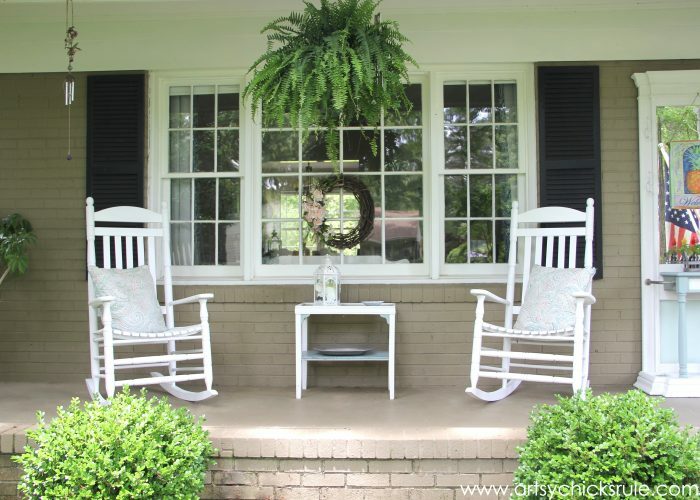 It was a lot of work to strip the paint….but the rest of the changes were really pretty simple. New paint with some distressing to pull out the details, new knobs, new pulls, etc. 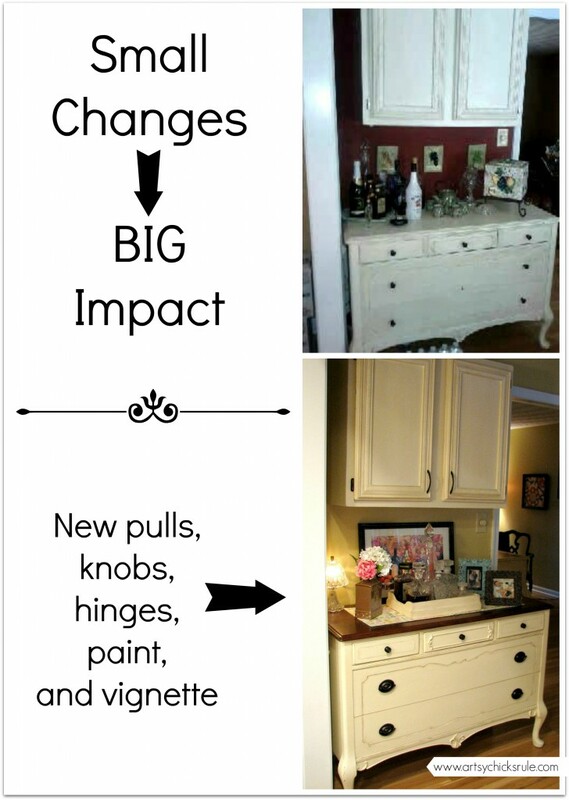 Amazing what a few small changes make…. I love reinventing furniture and spaces in my home. How about you? I’m so excited about the new year and all that we have planned….quite a few DIY projects (large and small) in our home and many (many, many!) paint transformations. So keep an eye out….there is much, much more to come. I always post projects and things I’m working on plus lots of fun random dailies. 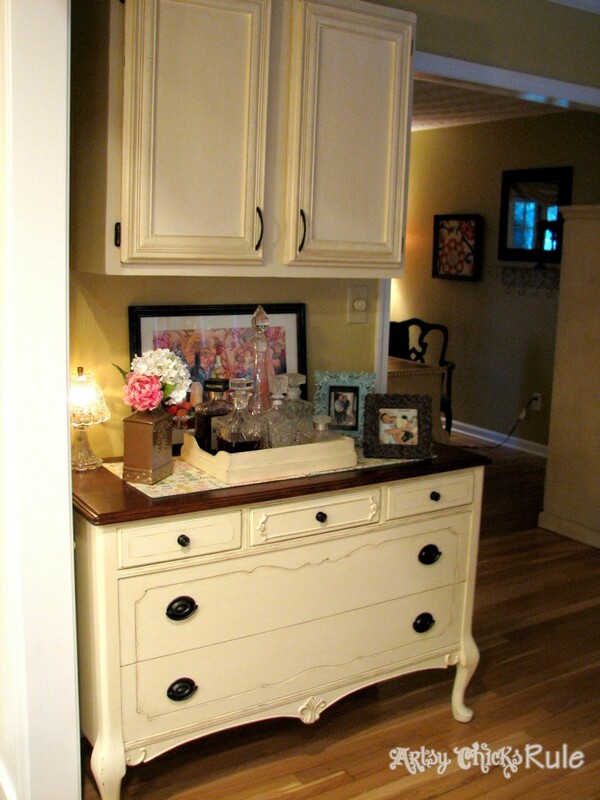 Your dresser looks so nice and the storage that it offers in your living room is convenient. 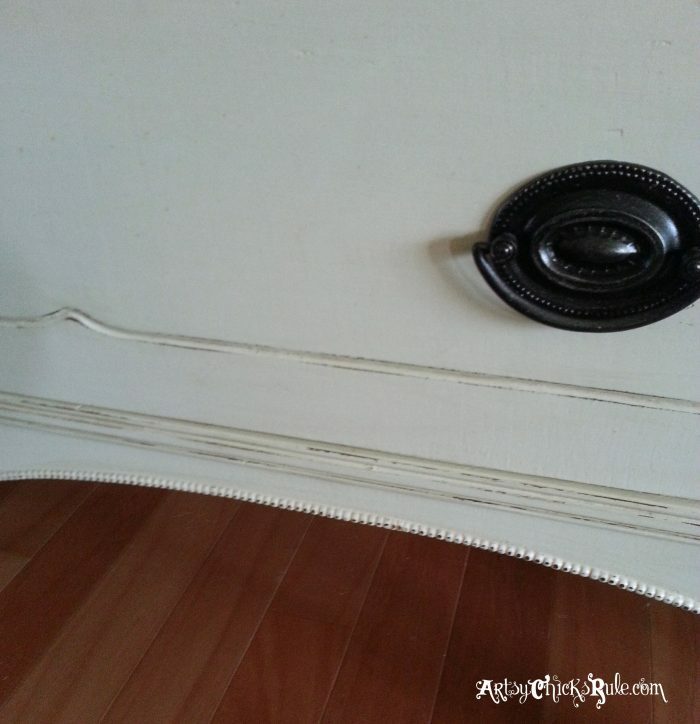 I really like all of the detail on the front of the dresser. I completely GET the withdrawal. We have our own shop and I look forward to painting furniture. 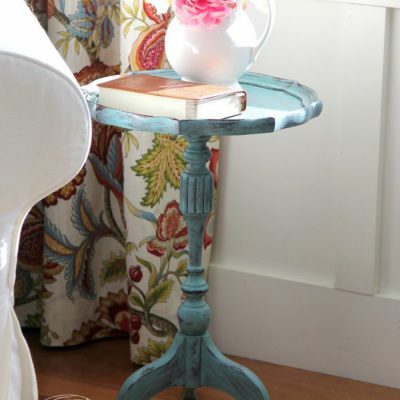 I REALLY look forward to painting furniture for our home. Great job! Oh so great you understand! ;) I do have to sit with most pieces I get for awhile until it talks to me though. Then I can hardly wait to tackle it! I love how you kept the top wood. It is just a stunning color. I’m always so impressed with your furniture skills! Just stunning Nancy. Great job! Its beautiful. What color paint did you use? 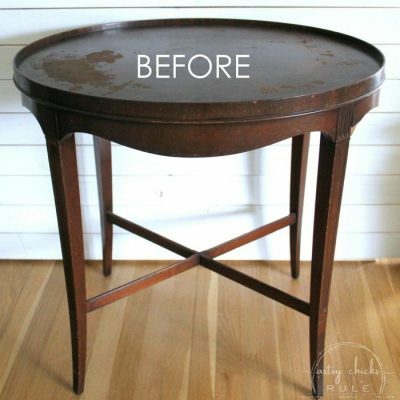 Also, have you used spray paint on new wood furniture that has a stain and poly finish? 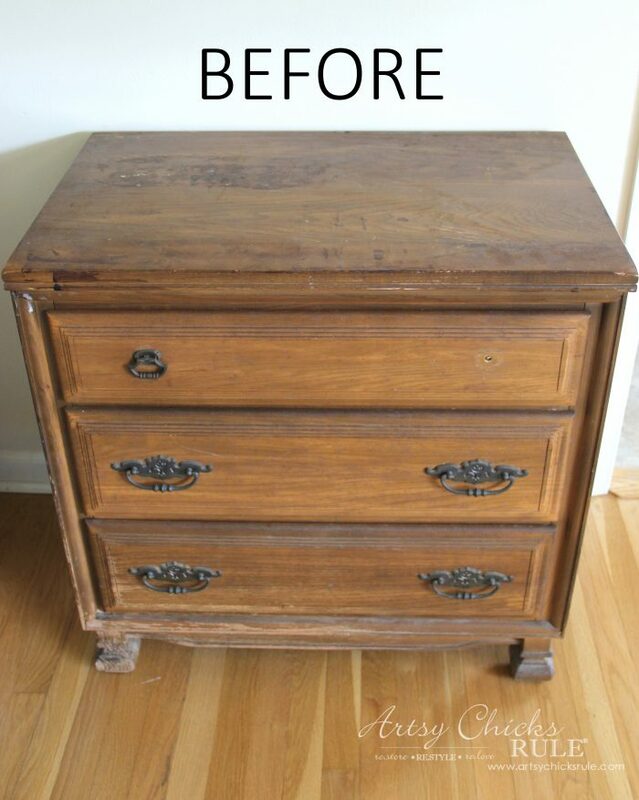 I stripped one drawer and sprayed it. It looks great but it was alot of work. I was wondering if I could just prime and spray the rest with a similar result. Love your blog. Thank you! Sorry, I don’t have the exact color (I’m a mixer! I mix up colors until I get what I’m looking for..and this is one I did that to). I have not used spray paint on fresh, new wood, no. I have spray painted some chairs recently however (they were stained). ;) I’ll be doing a post on them soon. 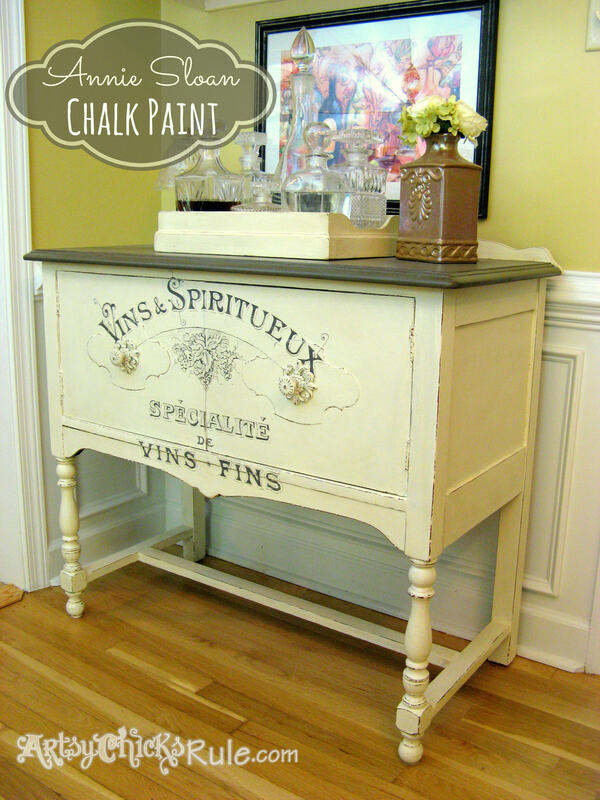 I really like painting with latex or chalk paint much better though. 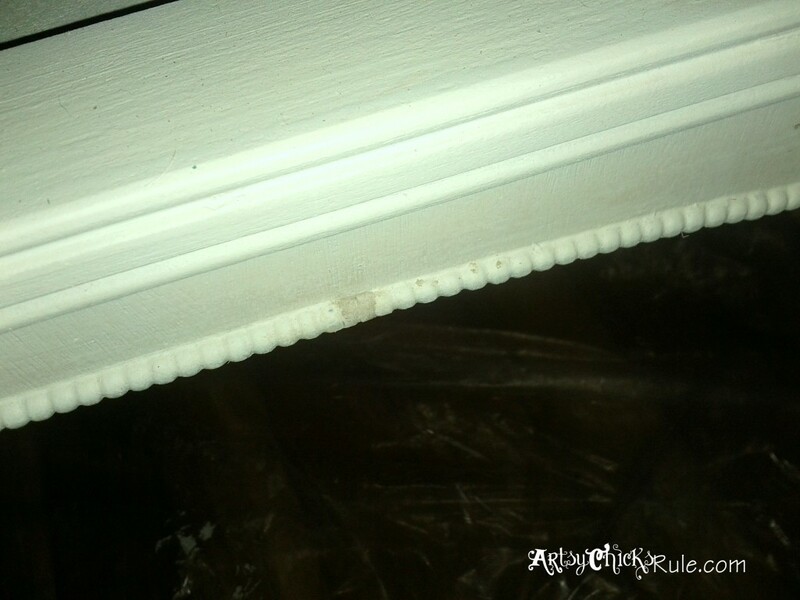 You could probably spray the rest…but be sure to use light, even layers so it doesn’t run (which spray paint has a tendency to do) You can seal it after with any spray sealer or poly. Nancy, that piece is just beautiful. It is one of my favorite pieces you have done. 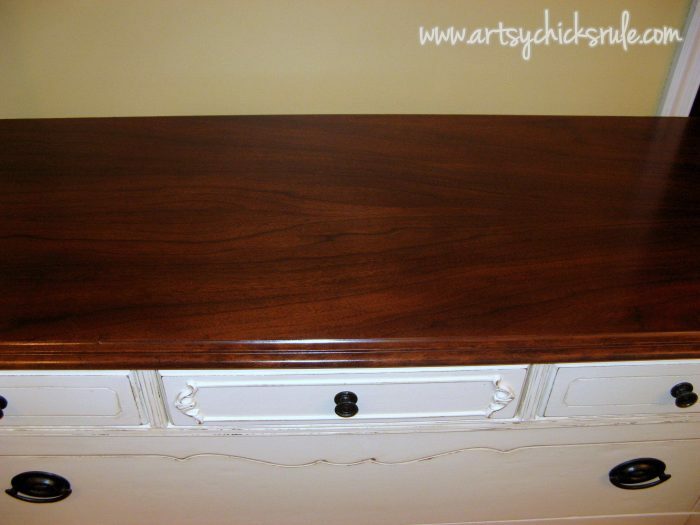 I love stained tops with painted bottoms. Very classy. I look forward to seeing what other things you have coming! Thank you Karen! :) I love the wood tops too!! 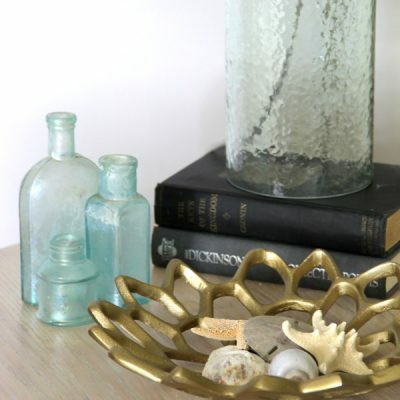 I want to add some beautiful rich wood back into my home (like those wood counter tops I can’t wait to get started on!! ;) ) One day!! Thanks so much Christy! I love a little peek of wood too! :) I am a contrast loving girl so it’s no surprise though! I love make overs like this! you did an amazing job! Thanks so much Shannah! 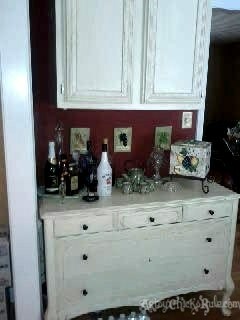 :) I love transforming furniture! 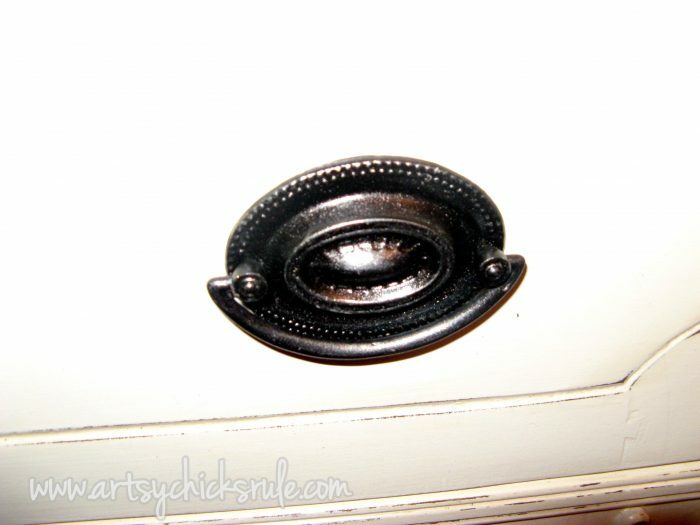 The drawer pulls were sprayed with ‘oil rubbed bronze’ and then you added a touch of gold. How did you add the gold? Was it just brush painted on top? 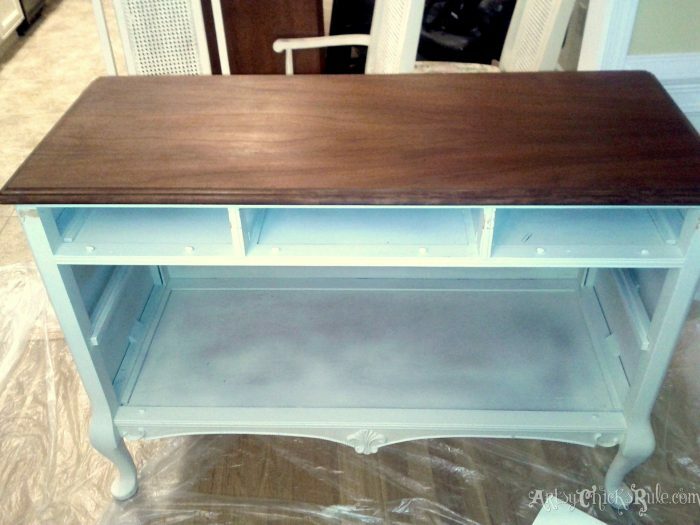 I want that look for an old desk I’m working on (the stained top, painted bottom and the darker pulls). Hopefully when I’m finished it’ll look as nice as your piece does. I am sure yours will be beautiful! Would love to see it when finished!! Love the hardware you have put on the buffet. I am working on a buffet right now can you tell me where you purchased them or from what web site it was. I’m so sorry, I have no clue where I bought those now. I wasn’t blogging at the time so didn’t keep that information. I always do now though…and share it! :) If I come across again, I’ll reply here and let you know.